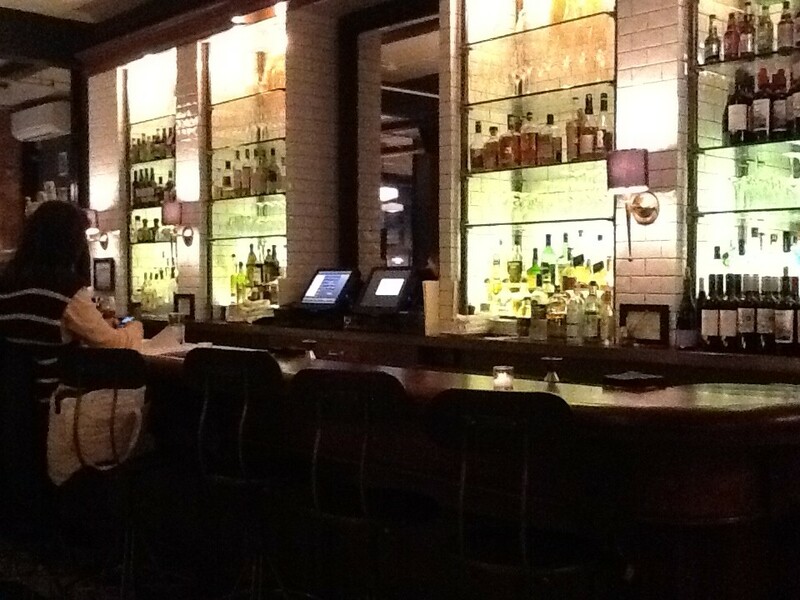 Happy Hour 4:00 – 7:00 PM (Interior Photos By Gail. Food Photos By Anne Raso). In the twenty five years I’ve lived in Manhattan, I’ve never known there to be a dearth of inventive new restaurants popping up in the trendy Flatiron District. Of course, there’s always room for one more, especially when that place does everything as impressively as Prandial. This American Bistro flaunts an interior that’s a perfect balance of rustic and elegant, and a kitchen expertly helmed by Executive Chef Pierre Rougey (formerly of Raoul’s) – a man whose firm handshake is as memorable as his cuisine. Old World New York charm abounds in a mix of Industrial materials (check out the iron railings along the perimeters of the raised dining area) combined with vintage decorative flourishes (mirrors, clocks), soft lighting and both table seating and comfy booths. I was a fan before we even ordered. Once I tasted the food, however, it was love at first bite. The menu offers a full page of enticing starters, so it was hard to chose, but we settled first on the Artichoke Salad ($12), a very creative way to do a green vegetable salad. 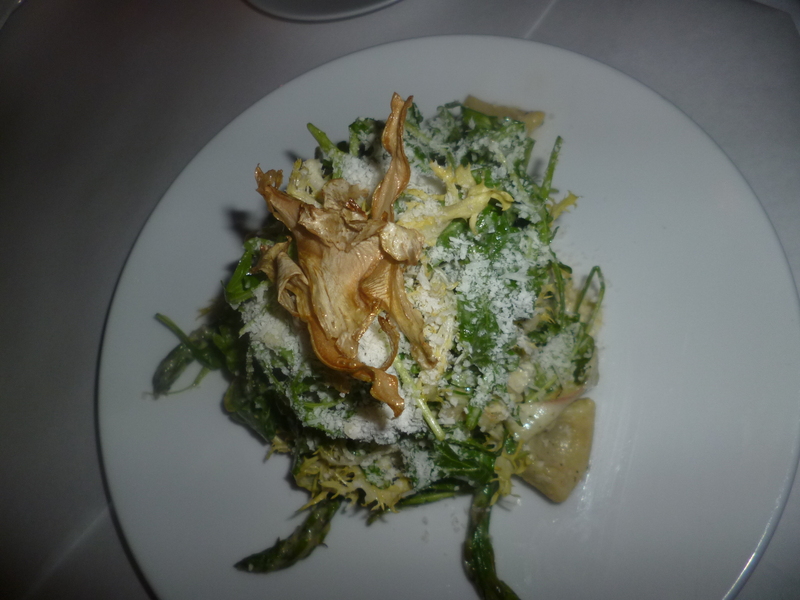 In addition to frisee, arugula and the promised tender artichoke hearts, we also discovered asparagus, fennel and hearts palm (decoratively shaved into spiral ribbons) all nesting on our plates. A sprinkling of parmesan highlights an emulsified, lemony French dressing that’s a refreshing break from traditional vinaigrette. 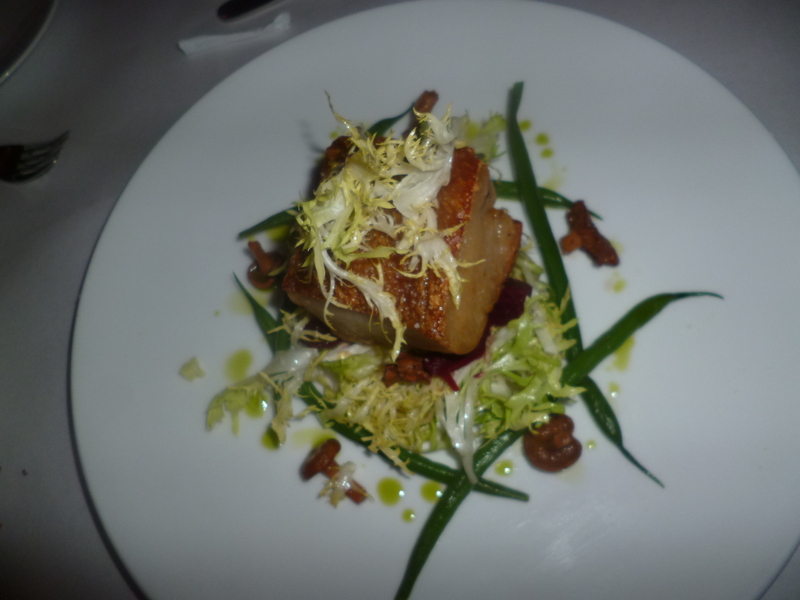 We were also tempted by the crispy, luscious Pork Belly ($15.00), served with Haricots Verts, Beet Salad and Pickled Chanterelle Mushrooms (Chef Rougey does all of his own pickling and canning in house). Assuage any feeling of caloric guilt by splitting this dish with a dining companion! They say that you can tell a lot about a restaurant by how it does Roast Chicken, and Prandial’s Roasted Chicken ($23.00) earns high marks. 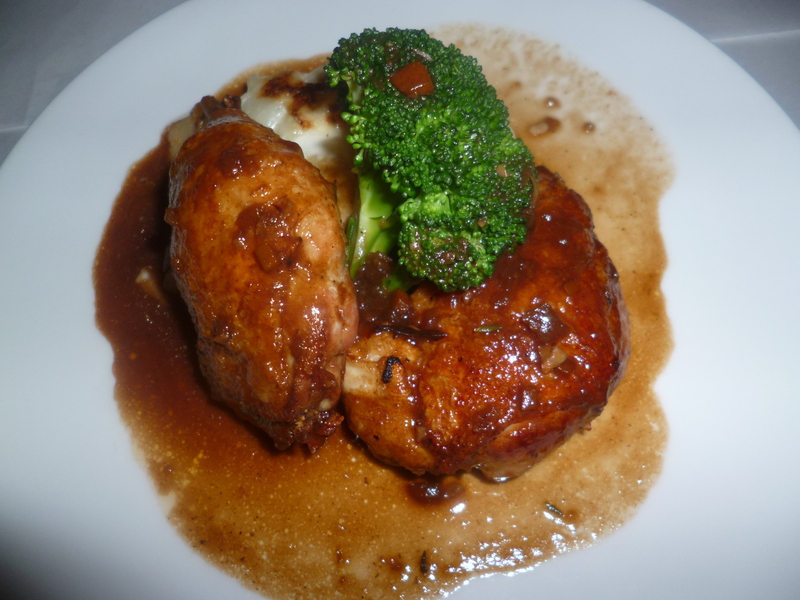 Served in its natural jus (accented with a hint of Rosemary), with Broccoli and a generous portion of Potato Gratin on the side, the skin on this chicken is so crispy you would swear it had been deep fried. The secret, according to the Chef, is just to close the oven door and keep it closed. Basting, he offered, is the worst thing you can do to a roasting bird if you want a crispy skin that will seal in the natural juices. Remember that when Thanksgiving comes around! 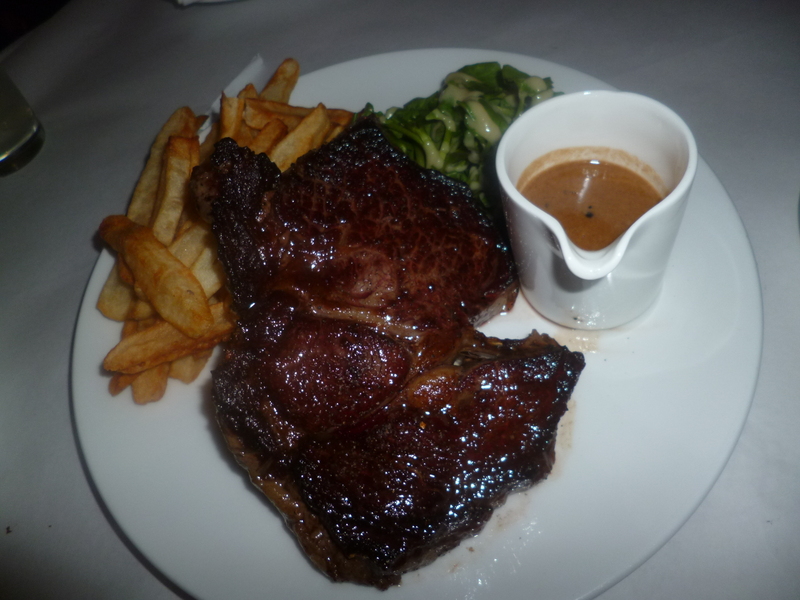 Red meat fans will also flip over the Grilled Ribeye ($35.00), a massive slab of tender beef served with House Fries and Watercress Salad and accompanied by a side of mild Black Peppercorn Sauce. The creamy sauce is Chef Rougey’s way of Americanizing the black peppercorn crusted Au Poivre preparation which, he says, many diners find too peppery for their taste. We suggested that a bit more black pepper could safely be added to the sauce without fear of offending any delicate taste buds. Alternately, you can always ask for a twist or two of cracked black pepper, if that is how you roll. 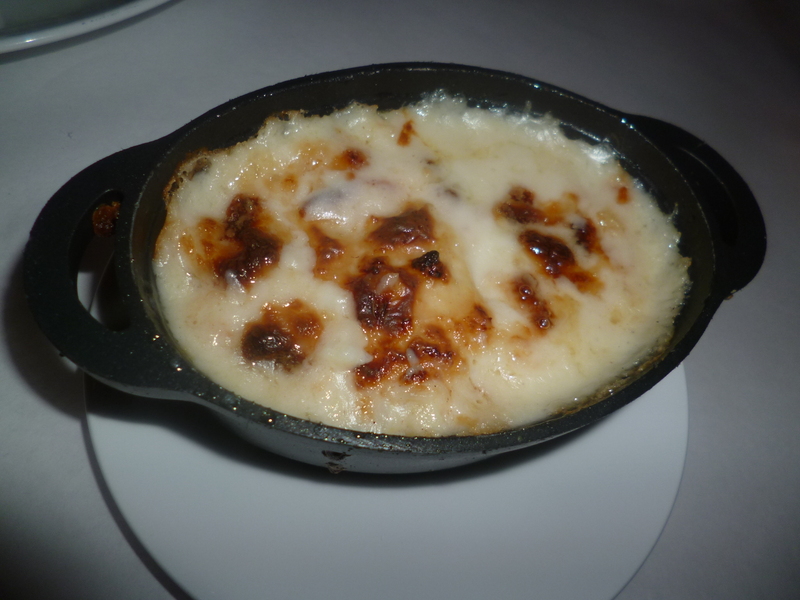 A side of Cauliflower Gratin ($8.00) baked in an iron ramekin with light béchamel sauce and swiss cheese arrived at our table near-bubbling with an appealing oven browned top. This portion is generous enough to share with a dining companion. It is not easy to “make room for” dessert after such a feast, but we did our best to sample two of Prandial’s sweet treats (all desserts are $9.00). 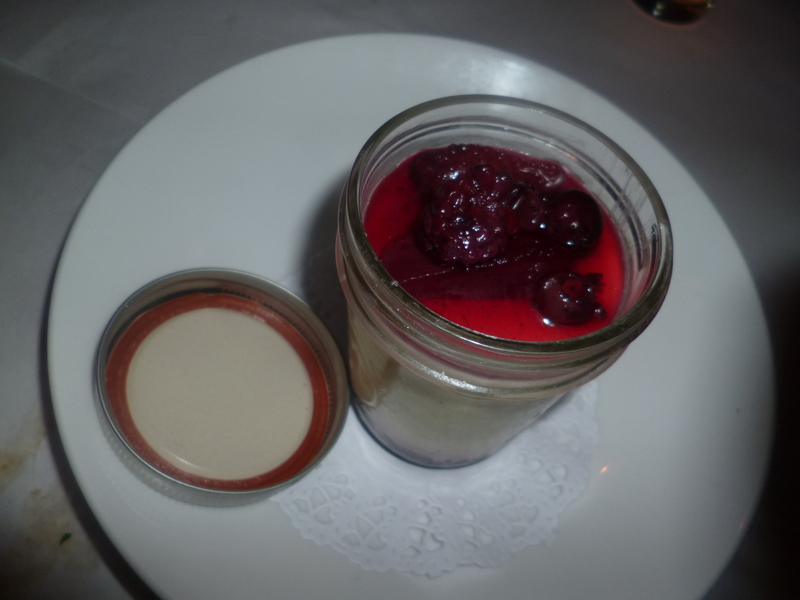 We were surprised by the decadent deliciousness of the Buttermilk Panna Cotta, served in a canning jar with a sweet Berry Gelee at the bottom and topped with Port Wine-poached Berries. This rich and creamy Italian pudding has a tangy-sweet flavor (think: cheese cake) and a slightly less custardy texture, which we enjoyed very much. 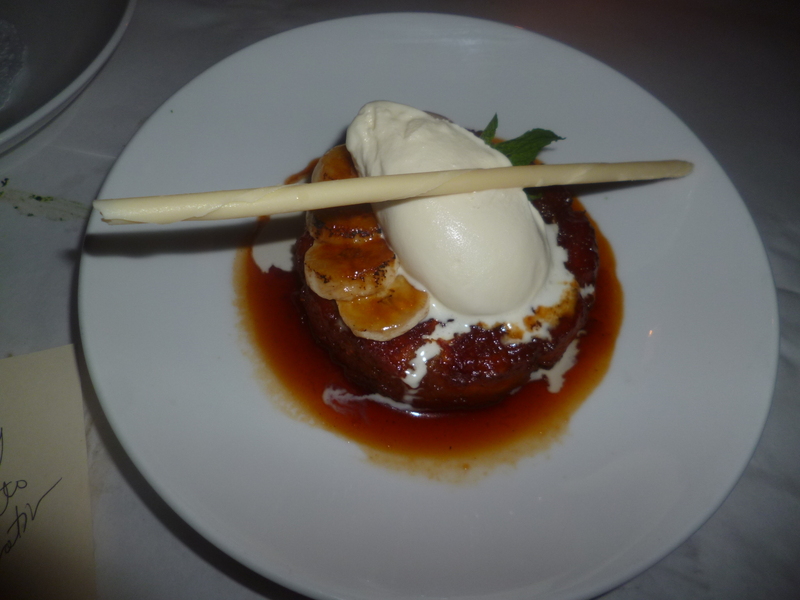 If you are looking for truly unforgettable dessert, order the Banana Upside Down Tart, a phylo pastry and Bananas Foster amalgam topped by bruleed bananas, caramel sauce and vanilla ice cream and garnished with a white chocolate straw. This dessert is huge and, again, perfect for sharing (possibly with several people) after the type of rich delicious meal you are going to be enjoying at Prandial. We are currently dieting for a return visit. 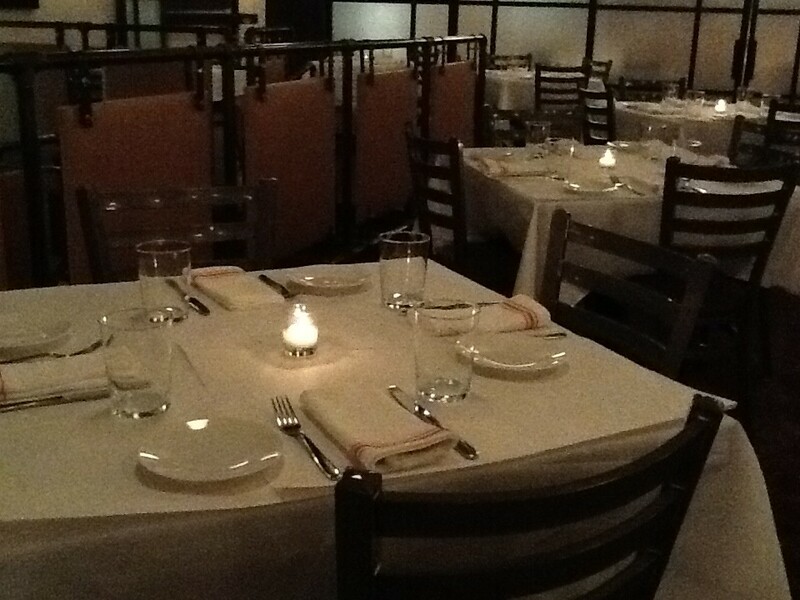 Prandial is Located at 31 West 21st St. (between Fifth and Sixth Avenues), New York, NY 10010. 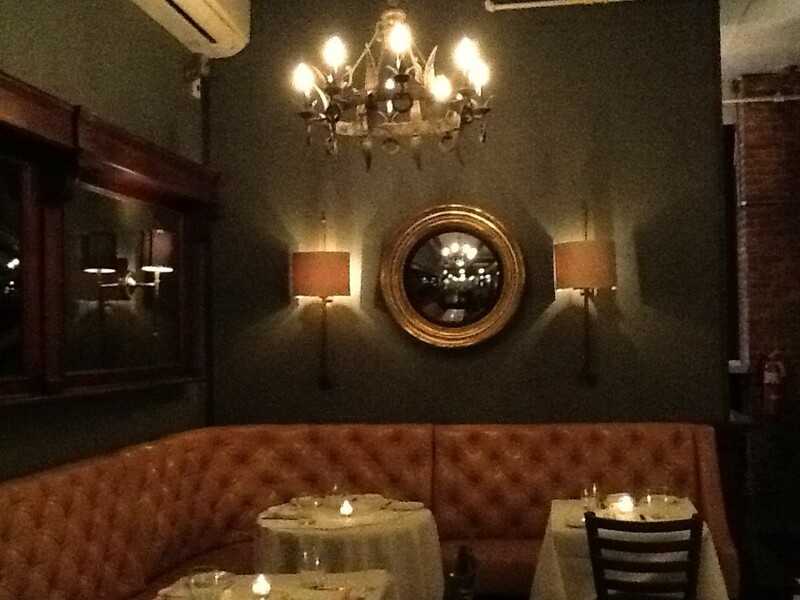 Visit their Website at This link or Phone 212-510-8722 for Reservations. ← Happy Birthday, Steve Harris of Iron Maiden!